Representatives from the Policy & Politics journal team are delighted to be attending the 3rd International Conference on Public Policy at the Lee Kuan Yew School of Public Policy, Singapore. We are looking forward to celebrating with our authors, reviewers and board members over our recent impact factor rise which has taken us into the top quartile of all the international journals in both public administration and political science. You can read the top cited articles contributing to our impact factor of 1.939 for FREE until 31 July! Many of our Editorial Advisory Board members are attending too so do approach them if you want to get their views on the journal as a potential publication outlet. They are Jon Pierre, Eva Sorenson, Isabelle Engeli, Christine Cheyne, Zachary Morris, Michael Moran and Paul Maginn. With such incredible variety and impressive quality across the 1,500+ papers being presented at the conference, we are looking forward to meeting and discussing research ideas with many of you. 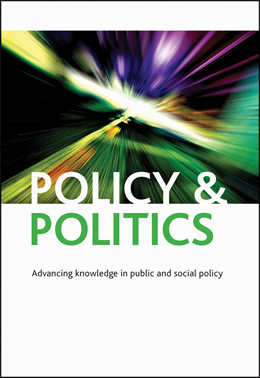 The Policy & Politics exhibition stand is located in the exhibitors’ hall alongside our publisher Policy Press, so please do stop by to find out more about the journal. We’ll look forward to seeing you.